Trip Elevation Total: 9375 ft. This day began with the always wonderful drive into the Wet Mountain Valley with the wonderful views of the Sangre de Cristo range. 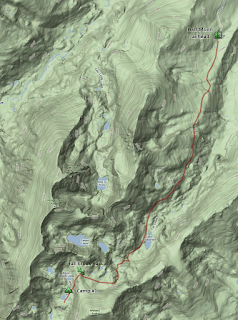 This hike though it begins and ends in different drainages on the east side of the Sangres has a single trailhead. We parked and geared up and headed to the northwest into the Venable Lake drainage first. This hike predominantly follows Venable Creek the whole way. This means on the positive side that there is always water relatively near the trail for an abundance of good campsites. On the downside, the mosquitos were terrible every time we stopped and even while hiking. As seems to be normal on our backpacking trips, we took some sprinkles late afternoon as we were nearing our intended camp area. We saw Venable Falls and started looking for campsites not long after. We found a good location, still below Venable Lakes, with good water access and a nice flat tent pad to set up upon. Today could be characterized as an exploration day. We started with beautiful blue skies as we made our way onto the trail. Our first stop was a broken down log cabin which was just shortly west of our camp. All the parts of the cabin still seemed to be present but it was clearly "leveled" by weathering over the years. Along the ascent past the cabin up the slope to Venable Lakes we were pleased to find Columbines in abundance. At the lakes we took some time to explore around the lakes and contemplate the fishing possibilities. As is typical in the drainages in the Sangres, the views out to the valley below were impressive. From the lakes we hiked southwest along the main trail to a junction above the lakes at 12,400. We turned right (north) towards Venable Pass. From Venable Pass we had great views to the west at the handful of 13ers in that direction. While up there Denny and David made a quick run up to the Unnamed point at 13,012 feet. The pass itself was just shy of 12,800. We hiked back down to the junction and then went on a reconnaissance mission to see what the Phantom Terrace looked like. We would be taking our big packs through this area tomorrow and wanted to know what we were getting into. We went up the trail to about 12,500, just far enough to get a look at what was ahead. Today was our longest day of hiking on this trip. We repeated yesterday's beginning from Camp #1 only this time we had packed up and had the big packs with us. We traced our steps up to Venable Lake and then on to the junction at 12,400. From there we headed left (southwest) towards Phantom Terrace. This is the very steep southeast side of Venable Peaks northwest ridge. 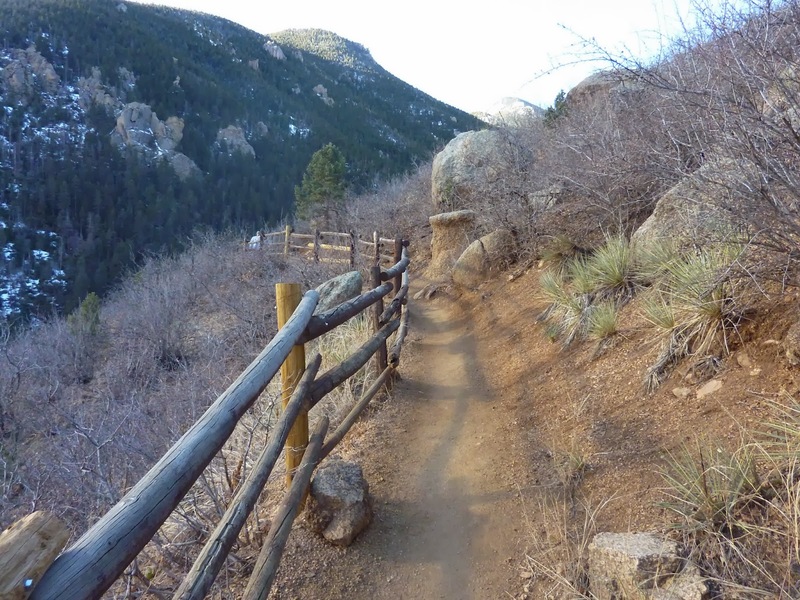 The trail in this section gets narrow for a section with significant exposure down the slope to the side. We made our way careful through that obstacle getting several great photos along the way. From there it was an easier stroll up to the unnamed pass just to the east of Venable Peak. While we took in the views from there Denny and David bagged another peak and made a quick run up to Venable Peak and back to us. From the pass it was a clear trail traversing around the west side of Spring Mt. to the pass near Comanche Peak. At Comanche Peak, we all finally decided to get a peak together. We headed up the short climb to Comanche Peak leaving our large packs behind. As we were up on Comanche we had beautiful views including shots to the south of Kit Carson and Challenger. Unfortunately, we also took in views of little furry marmots checking out our packs below. When we descended back to the saddle we found our green foam mattress pads chewed up pretty bad by our furry friends. Luckily they were on the outside and the packs themselves were safe. From the pass we made the descent down to Comanche Lake. We had delightful weather, beautiful views and abundant wildflowers on our stroll into Comanche Lake. We set up camp in a terrific green meadow on the northwest side of the lake. One of the highlights from camp this night is we saw several rabbits running around camp come early evening. This made for some entertainment trying to figure out what they were up to. It also led to us hanging our packs from the trees that night to keep inquisitive furry animals from chewing holes in them. Day 4 was another exploration day for us. We stayed at camp #2 this day near Comanche Lake. Mark, Denny and David set out to do some climbing today. We hiked northwest right up the slope to Spring Mountain's northeast ridge. The wildflowers were spectacular in the steep meadows along the slope. At the crest of the slope Denny and David set out for another 13er and made their way for Spring Mt. Mark decided to explore the other direction solo. Denny and David had some steep climbing up the northeast face of Spring Mt. but were successful in summiting. Mark hiked a mile plus along the crest of the northeast ridge to near treeline with great views of the Wet Mountain Valley out to the east. On the return Mark descended below the crest of the ridge seeking views of the Comanche Lakes drainage. He eventually bushwhacked his way through several steep descents to the main loop trail below Comanche Lake for a quick hike back to camp. Today was simply a hike out day. We lamented leaving our beautiful camp at Comanche Lake, and we would remember this as one of the more amazing hikes we'd done with the views and the peaks and the surrounding scenery altogether. The hike out was 3k in elevation and crossed over several smaller drainages to meet up with our original trailhead. The day wouldn't be over for us upon reaching the bottom however. As we would hop in the car and make our way down and around the southern trip of the Sangres near Blanca Peak for the Lake Como trail. That would be our late afternoon and evening trek up to Lake Como with a goal of hitting Little Bear Peak tomorrow, less than 24 hours after our exiting of the Comanche-Venable loop.